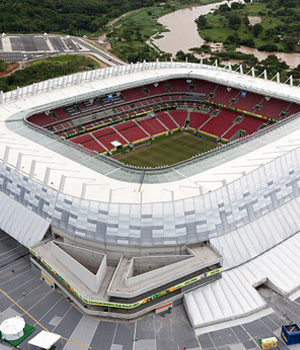 Arena Pernambuco is located in Recife, Brazil. This stadium will host five matches during FIFA World Cup 2014. Recife hosted one of the matches during FIFA World Cup 1950. 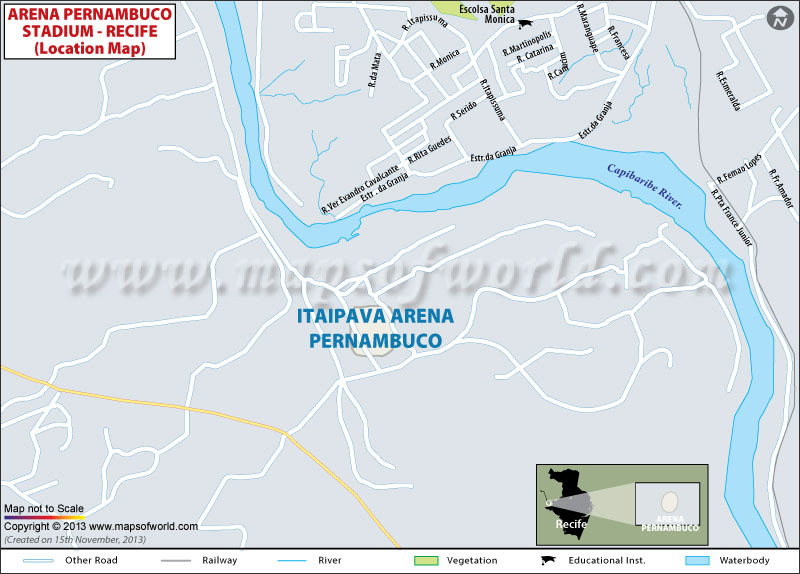 Arena Pernambuco is a complex that consists of shopping centers, restaurants, and cinemas along with the grand stadium. This stadium is located at the metropolitan zone of Recife, in Sao Lourenco da Mata, which is 19 kms away from Guararapes Airport (international airport). The total capacity of this stadium is 42,849 spectators. At present construction work is going on around the surroundings of the stadium. Accommodation facilities, entertainment arenas, and others will come up shortly. In Recife, most of the entertainment places and hotels are located in the southern part of the city. In the coastal areas like Boa Viagem, you will find proper places of accommodation, foods, and drinks. Recife is the capital city of Pernambuco, located in the north east part of Brazil. In the country, it is the 4th largest metropolitan area. Many people call this the capital of the North East, because of its economic importance in Brazil. Recife is economically as well as strategically important because o its port. In fact, this is the port that connects the Atlantic with Olinda, one of the 13 cities present in Pernambuco. Due to the presence of historically significant architecture including levees, canals, and bridges, some people call it ‘the Brazilian Venice'. Here you will find some of the most beautiful beaches present in Brazil such as Boa Viagem and Porto de Galinhas. Some of the must-visit places in Recife are Pina Beach, Madre de Deus, Nossa Senhora do Pilar, Franciscan Convent of Saint Anthony, Casa Manuel Bandeira, Museum of Natural History Louis Jacques Brunet, Aluísio Magalhães Modern Art Museum, and Benfica Cultural Center. Itaipava Arena Pernambuco is situated in a suburb of Recife called São Lourenço da Mata, which is just 18 kms away from the Recife city center. Enough transport is available to reach the place in the least possible time. Prices of tickets vary on the basis of section, category, and date. Ticket prices vary from $552 to $1,058.